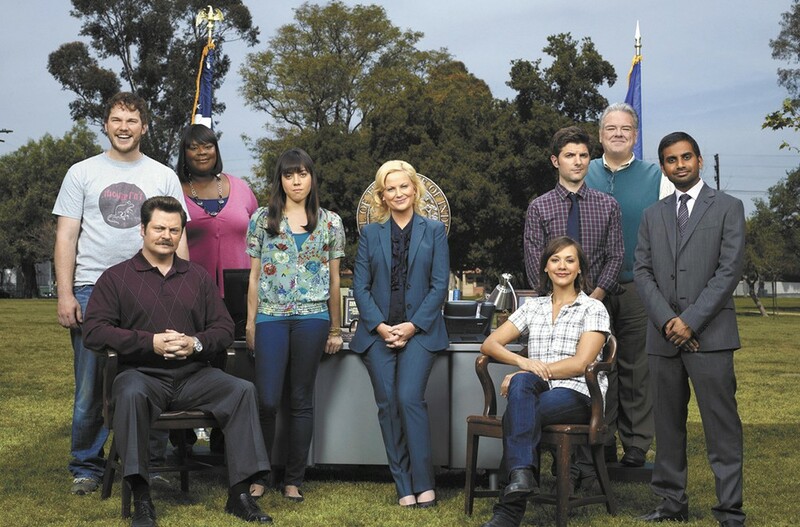 The Parks and Recreation cast. The advertising men and women of Madison Avenue shaped culture in the 1960s – and were shaped by it. That's what we learned in seven seasons of this period drama on AMC. The style, the sexism, the alcohol — Mad Men weaves a compelling story of deep characters in a shallow industry, referencing the turmoil and trends of American culture over the course of a decade. And it all came to a close in May. Mad Men raised the star power of Jon Hamm, who won the Primetime Emmy Award for Outstanding Lead Actor in a Drama this year for his role as Don Draper. The show was nominated for and received numerous awards during its run. It was popular for so many reasons, none of which you have to be a film critic to enjoy. It would make a great gift for the collector or TV-binger without a Netflix subscription. References to this sci-fi trilogy have the feel of cult-classic obsession, but Back to the Future was a mainstream success in 1985, when the first movie was the highest grossing film of the year. We may not wear colanders on our heads or fly around on hoverboards like Back to the Future II suggested when Marty McFly (Michael J. Fox) traveled to Oct. 21, 2015, but the entertainment value of his adventures with Doc Brown (Christopher Lloyd) isn't diminished by these falsehoods. Think of how mind-blowing it is that now we're really going back to the future... since Marty's travels to the future in time all exist in our past. The new edition includes the trilogy and hours of bonus features on DVD or Blu-ray. The boy who just wanted to impress a girl. The girl who just wanted to do her own thing. The genie who stole the show. I know Pixar movies are new and flashy, but nothing beats this classic animated musical. Disney re-released Aladdin this year on Blu-ray and HD DVD, making it the perfect gift for the nostalgic adult or uninitiated youngster on your gift list. The new edition includes a brighter, more vibrant picture, but the songs are the same. From "Friend Like Me" to "A Whole New World," it's time to reintroduce the greatest songs in Disney history — the ones I used to annoy my parents and siblings long before "Let it Go" drove us all nuts. The end of Parks and Recreation (pictured above) this year hit me on a personal level; in my opinion, it's much better than its much-beloved sibling The Office. The series follows the efforts of a low-level bureaucrat, Leslie Knope (Amy Poehler), who starts in the Parks and Rec department in Pawnee, Indiana, wanting to make a difference in the lives of her neighbors who just... don't get her. She's passionate, capable, and she doesn't steal all the attention. The cast — including Nick Offerman, Aziz Ansari, Aubrey Plaza, Chris Pratt and Adam Scott — is amazing. The story is endearing, funny and, sadly, too brief. I can't think of a single person who wouldn't love it. For a woman whose life is words, losing thoughts and language to early-onset Alzheimer's disease is the nightmare. That's the reality for Dr. Alice Howland (Julianne Moore), a linguistics professor who is diagnosed after she starts forgetting words and gets lost while jogging her usual route. As the disease progresses in Alice, her children watch helplessly and wonder about their own futures. This movie is enlightening to anyone who hasn't witnessed the effect of this disease on a loved one. Moore's performance was affecting — and she was rewarded for it. She won the Academy Award for best actress in a leading role, beating Reese Witherspoon (Wild) and Rosamund Pike (Gone Girl). I loved all three of these movies for different reasons. What they have in common is a strong female lead in a not-so-stereotypical role, so consider any of them for your movie-loving friend. In case you needed convincing, opening a theme park to let people see real dinosaurs in their natural habitat is still not a good idea. The dinosaur expert/trainer, Owen (Chris Pratt), gets that, and the businesspeople looking at the profit potential don't. Claire (Bryce Dallas Howard) is one of the latter, who thinks that the park needs a bigger and better attraction. She and others are enlightened to the dangers of creating a new breed of dinosaur when the giant hybrid escapes. The newest Jurassic movie lives up to expectations for people who loved the original. Giving a monster movie to that special someone in your life never fails to please.